British Charcuterie.live Awards | Food NI - Our Food So Good! London 21st February 2018: The co-founders of BritishCharcuterie.live, Henrietta Green and Charlotte Sharp-Neale, launched their first awards at an event attended by specialist producers, award judges, eminent chefs and top food writers, at the Plain English showrooms in Marylebone, London, last night. The British Charcuterie Awards will be held on the first day of the BBC Countryfile Live show on August 2nd 2018. 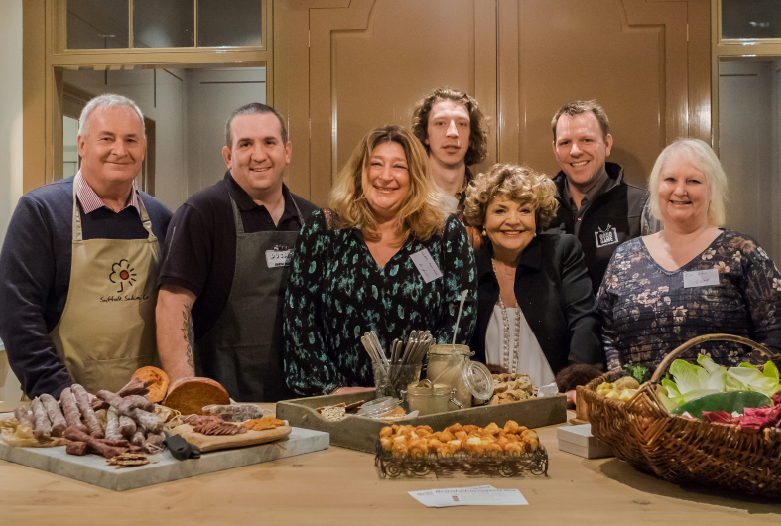 “As British charcuterie is showing such dynamic development, the time is right for all producers, artisanal or larger-scale, to have an appropriate public showcase for their diverse ranges,” said Henrietta Green, addressing the guests, as she called for UK farmers, butchers, producers and chefs to participate. “For us, it is about celebrating the Britishness, promoting excellence, making the consumer more aware of the variety, choice and endless possibilities of charcuterie. It’s about adding value, reducing waste, finding alternative income streams for farmers and now that we seem to be heading for Brexit – making our own and fighting back the imports. With well over 100 products already entered within the first three weeks of going live, it promises to be an exciting, wide ranging and interesting contest. 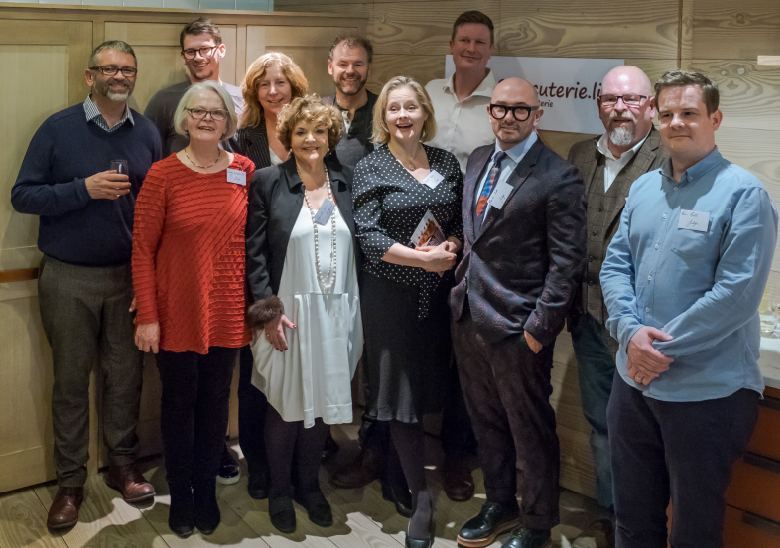 Judges, many of whom attended the launch event, include leading food, retail and hospitality experts, include Head Judge John Gower of New York’s Charcuterie Masters; British Bake Off co-judge Prue Leith; Chefs Angela Hartnett, James Lowe, Ben Tish, Adam Handling, Chris Galvin, Rowley Leigh and Neil Borthwick; master butcher David Lidgate; charcutier extraordinaire Stephane Reynaud; Monika Linton, founder of Brindisa; Rich Summers of The School of Artisan Food; food writers Xanthe Clay and Felicity Cloake; Graham Stoodley Charcuterie Manager for Harvey & Brockless, Shane Holland of Slow Food UK and Tom Beeston of the Rare Breeds Survival Trust. There are nine classes that range from cured and air-dried whole muscle products such as prosciutto to cured and fermented sausages such as salami. British regional products – traditional favourites including Bath Chaps or Lincolnshire Chine – have their own class as do all products made from authenticated rare-breed meats. A Champion of Champions Product and Champion of Champions Producer will be selected from the winners for trophies. “The increase in production of British Charcuterie is much more than just mirroring our foreign cousins. Our producers, many of whom rear their own livestock specifically for their charcuterie products, create great-tasting products – some new with distinctly local ingredients and characteristics, and others echoing our heritage. Butchers are re-discovering their traditional skills, pubs and restaurants have also woken up to its popularity and many chefs are now curing their own for serving to their customers,” says Henrietta Green. The awards judging will be taking place within The British Charcuterie Tent at BBC Countryfile Live at Blenheim Palace, Oxfordshire, which runs from August 2 – 5, and where there will also be Charcuterie for tasting and sale from top producers, and a bar serving Charcuterie boards. “Where better to make the important connections between farming and food and to encourage visitors to come and learn, experience and taste?” says Henrietta Green. Throughout the show, The British Charcuterie Tent will reflect this growing trend by celebrating with talks, demonstrations and tastings and running a competition for Britain’s Best Charcuterie Boards, sponsored by Tracklements. Visitors will also be able to shop from Charcuterie producers and snack at the Charcuterie bar. Class 3 Cured Fermented & Air-Dried Ready-to-Eat Sausage Products – these are traditional salami and other ground meat products that may or may not be cold-smoked. Class 4 Cured & Cooked Ready-to-Eat Sausage Products – these need cooking – typically poached or hot-smoked– before eating. This class includes Bologna, Mortadella, Luncheon Meats and hot-smoked Kielbasa etc. Class 5 Soft & Spreadable Products – these are made from cured and/or preserved meats. This class includes Pates, Parfaits, Potted Meats and Rillettes as well as products such as ’Nduja, Lard, Sobresada etc. Class 6 Cured Bacon – these may be green, cold- or hot-smoked but will need cooking before eating. This class includes streaky, shoulder or back bacon as well as rashers from other meats, poultry and game such as beef, duck etc.